The South Carolina governor has become the first woman and minority to join Trump’s administration. Indian-American to be appointed to a cabinet-level post in any US administration. “Governor Haley has a proven track record of bringing people together regardless of background or party affiliation to move critical policies forward for the betterment of her state and our country,” Trump said, referring to his former critic with whom he had sparred bitterly during the campaign. The 44-year-old daughter of Indian immigrants from Punjab, Haley is the first woman tapped by Trump for a top-level administration post during his transition to the White House. “She is also a proven dealmaker, and we look to be making plenty of deals. She will be a great leader representing us on the world stage,” Trump said, announcing the South Carolina governor Haley’s name as next US envoy to the United Nations. The presidential transition team said this would a cabinet-level position in the Trump-Pence Administration. The cabinet position would require confirmation by the Senate. If confirmed by the Senate, Haley would be the first Indian-American to be appointed to a cabinet-level position in any presidential administration. Commenting on her nomination to the key post, Haley said she would be happy to represent America at the UN. “I was moved to accept this new assignment for two reasons. The first is a sense of duty,” Haley said. “When the President believes you have a major contribution to make to the welfare of our nation, and to our nation’s standing in the world, that is a calling that is important to heed,” she said. 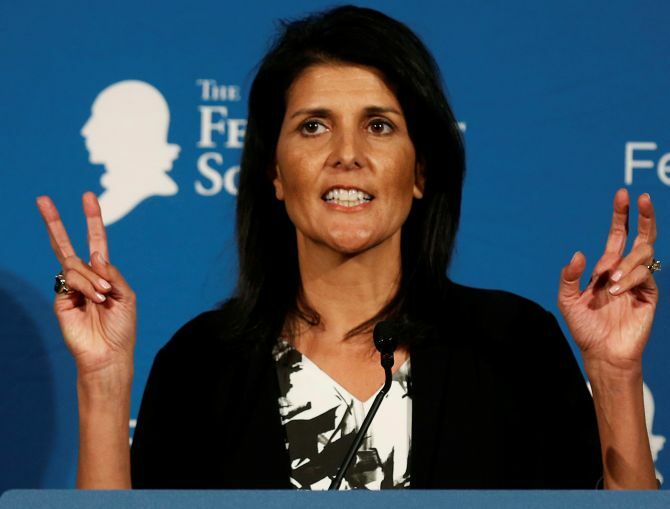 “The second is a satisfaction with all that we have achieved in our state in the last six years and the knowledge that we are on a very strong footing,” Haley said, adding that she will remain South Carolina Governor until the US Senate acts affirmatively on her nomination. Haley, a Republican, said this month’s elections have brought exciting changes to America. “Our country faces enormous challenges here at home and internationally. Last week, President-elect Trump asked if I would meet with him to discuss those challenges, which I was happy to do. He has asked that I serve our country as our next Ambassador to the United Nations. Pending confirmation by the US Senate, I have agreed,” she explained. Haley’s nomination is a turning point for the Indian-American community which is increasingly playing greater role in American politics. Noting that Haley is one of the most universally respected governors in the country, the official announcement said after working at her family’s business, she turned her focus to economic development and has travelled abroad to negotiate with international companies on behalf of South Carolina. As governor, she has led seven overseas trade missions and successfully attracted jobs and investment through negotiations with foreign companies, it said. One of her trade missions was to India. Trump’s plan to offer the job to Haley, a rising Republican star, was first reported by the Post and Courier. Haley, currently the youngest governor in the country, has already carved out a legacy for herself, serving as her home state’s first female and first minority governor. Haley, who is serving her second term, has worked on trade and labour issues as governor but brings little foreign policy experience. Her views on various US military and national security matters usually fall within the Republican Party’s hawkish mainstream. Trump met with Haley on Thursday at Trump Tower in New York as part of the round of meetings the president-elect has held. With her appointment to the top diplomatic post in UN, Haley has become the first woman and minority to join Trump’s administration. She would replace Samantha Power. Haley was critical of Trump during the primary campaign and had backed Senator Marco Rubio in the Republican primary. However, before the general elections, she switched her position, saying she would vote for Trump. 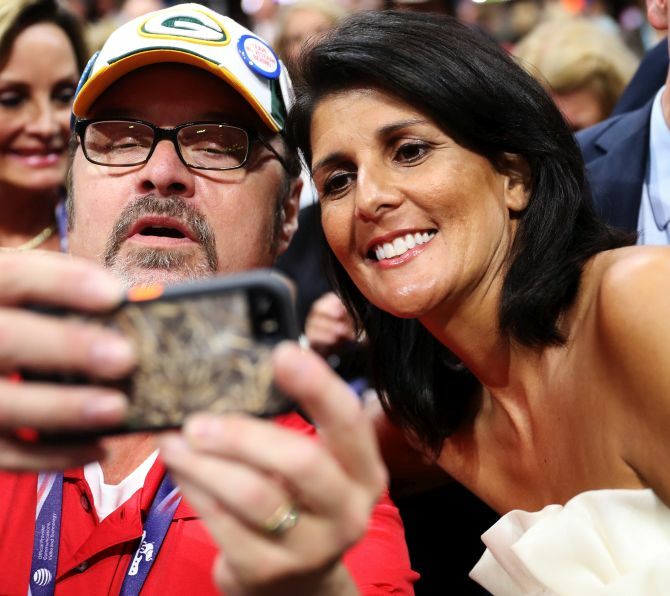 Born Nimrata “Nikki” Randhawa, Haley is the first minority and female governor of South Carolina, a deeply conservative state with a long history of racial strife. She is the first Indian-American woman governor and the second Indian-American governor of any State. Prior to becoming governor, she represented Lexington County in the South Carolina House of Representatives from 2005 to 2011. A true fiscal conservative and savvy businesswoman, Haley’s leadership drove down South Carolina’s unemployment to a 15 year low by adding more than 82,000 jobs in each of South Carolina’s 46 counties, the transition team said. Prior to dedicating her life to public service, Haley worked at her family business. In 1998, Haley was named to the board of directors of the Orangeburg County Chamber of Commerce and named to the board of directors of the Lexington Chamber of Commerce in 2003. She also became treasurer of the National Association of Women Business Owners in 2003 and president in 2004. Haley is a proud graduate of Clemson University where she earned a degree in accounting. Haley and her husband, Michael, a Captain in the Army National Guard and combat veteran who was deployed to Afghanistan’s Helmand Province, have two children, Rena, 18, and Nalin, 15.